The lunatic fringe left in America cries out in anguish for President Trump to denounce the violence in Charlottesville — which, incidentally, he has done. But willfully ignores the threats and intimidation tactics of domestic terrorist groups like Black Lives Matter and Antifa that are responsible for initiating the violence not only in Charlottesville, but in Ferguson, Missouri and Berkley, California as well. That accurately describes Antifa and BLM to a tee! In August 2014, BLM organized their first in-person national protest in Ferguson, Mo. after a black thug named Michael Brown was shot and killed while attacking a white police officer. That protest led to stores being looted, a gas station being torched and police being shot at. It was the anarchists of Antifa who instigated the Berkeley riots in February to protest a conservative journalist being allowed to speak at the University of California. It was also Antifa that invited fellow anarchists to Charlottesville last week to help deny the citizens legally-permitted and Constitutionally-protected right to protest the removal of Confederate memorials from the city. And yet, fringe left leaders like the racist Senator from California, Maxine Waters, hypocritically labels the White House the “White Supremacist House” and blames the president for the violence while covering for those who initiated the carnage. The mayor, who is so hated by his own police force that they turned their backs on him during his speech earlier this year, should revisit the U.S. Code of Federal Regulations definition of terrorism. It does not apply to a group of citizens who have a Constitutionally-protect right to free speech. It does, however, apply to those who resort to violence and intimidation to deny that right. President Trump, who prides himself on his distaste for political correctness, should announce today that he has directed Attorney General Sessions to open a domestic terrorism investigation Antifa and BLM. 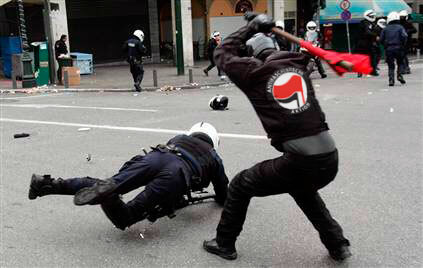 Until the liberal left stops using anarchists to attack conservatives and the mainstream media stops fueling their hatred by falsely blaming their victims, incidents like Ferguson, Berkeley and Charlottesville will never end.